Call us, if you must, Peter Pan. Or, simply, if you wish, Kiddies at heart. Or, believe us to have been deprived as children. But, whatever, neither of us, and not out of lack of want, ever owned a dolls' house. That is, until now. 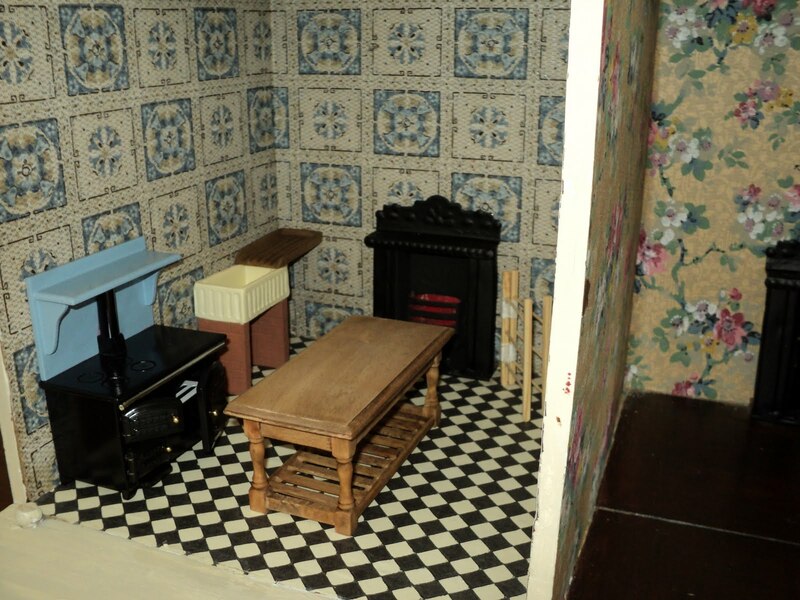 Purchased privately, and delivered to the door, the latest addition to our Brighton 'rooms' is a 1909 Lines Bros. dolls' house complete with window glass, period fireplaces and original 'brick' paper. Hove Villa, as we have named it [Kemp Town﻿, where we are, not having quite the same ring] is of very good provenance. G. and J. 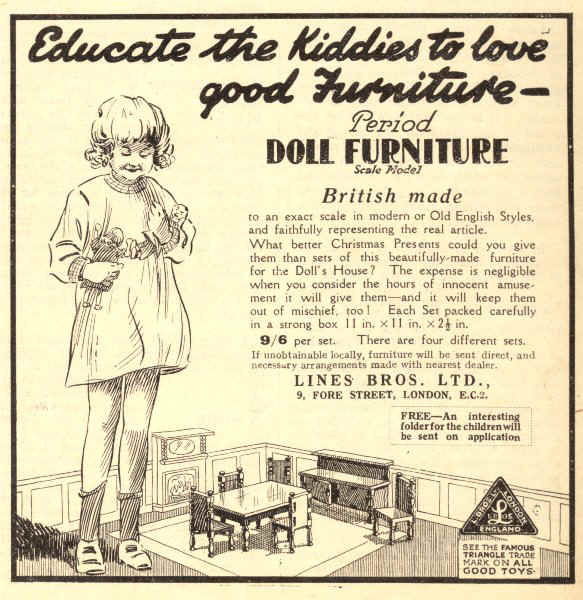 Lines Ltd. began the manufacture of children's toys in or around 1876. By the end of the Great War in 1918 the second generation of three brothers, then named Lines Bros. Ltd., developed the brand 'Triang', the success of which resulted in their becoming in the 1930s the largest producers of children's toys in the world. Deemed neither a protected nor an essential industry during the 1939 - 1945 War, when the factory concentrated on the making of machine guns, production declined in the years thereafter and by 1971 'Triang' had finally closed its doors, calling in the Official Receiver. And that could well be the end of the story. But not quite for our friend, Jeremy, now over 80 years is, intriguingly, the surviving grandson of one of the original company founders. Following a working life of designing yachts for the boat builders, Camper Nicholson, grown up toys here, he is nowadays most often to be found aboard his own boat sailing the Solent. Meanwhile, on shore in the Never Never Land, the hunt for furniture is on! I have never owned a doll house, though my cousin, Shelly, did and I thought they must be rich beyond measure. I loved looking into those little rooms with miniature furniture. I can well imagine how fun it is going to be in finding just the right furniture for yours. Enjoy! Lucky Shelly!! This clearly shows that our parents deprived us [and possibly yours too!!]. Yes, it is a little madness but we shall certainly enjoy collecting things for it. But, we are agreed, no actual dolls! I have always been fascinated by dollhouses. I had one as a child and played with it for hours, making up all kinds of stories about the house and the people who lived in it. My husband made one for my girls years ago but they were not so interested. Now I take it out and my grandchildren go into that wonderful world of imagination and memories flood back. We should have loved to have a dolls' house made for us. But how wonderful that the one made by your husband is now used and appreciated by your grandchildren. We do hope that you get a turn to play too! I don't remember having a doll house, certainly never one as fine as that, but I was into model horses early on and did have some nice stables! How lovely this sounds. Neither of us had a pony or a model horse but, thinking now, we should have probably liked both! Whatever, your comment made us smile. Hello! I was so glad to hear (via your lovely and as always, thoughtful comment) that you had arrived safely. What a lovely addition to your rooms. My. In these crazy times when we feel obligated to get rid of everything, it makes me feel so thrilled that somehow, amidst the many, many moves in my family (perhaps once every four years), somehow my Mother never gave up the very fine 1930's dollhouse that she had inherited when she was a girl. At the time, I don't think that it was anything out of the ordinary, but now? Even when I was little it was obsolete. How I loved to decorate! And move the articulated dolls (though I can't tell you how relieved I am that you aren't purchasing any). My apologies for the long response but this most certainly did bring up memories. Your mother's 1930s dolls' house sounds absolutely wonderful. And, so good that it is still with you after all the moves. It is, perhaps always the case that as a child one takes so much for granted and yet in adulthood one cherishes these things which hold such poignant memories of the past. After a grey start, the weather has picked up and it is a glorious evening here. A heatwave is forecast for the weekend...!!! I love the almost-monochrome interior - very "now"! I used to be allowed to pick one new piece for my dolls house whenever we went to Tunbridge Wells for the day. My best buys were the yellow plastic bathroom furniture, strangely. Thanks for bringing back the memories - and good luck with finding pieces for your house. Wonder if the shop in TW is still there - not too far from Brighton. We are delighted that you like the new acquisition and that it brings back good memories. We shall certainly Google possible places in Tunbridge Wells for furniture as it is a very easy bus ride [we no longer have a car]from Brighton and is a town we much like. OHHHH! You are going to have so much fun with this! I love that you are kids-at-heart! -Makes me want to unearth my daughter's doll house. We had a blast with the furniture, wallpaper, lighting, and all those little accessories! Oh hooray! I'm so happy for you! We are so pleased that you have added your name as a Follower. Thank you so much. We intend to furnish all the rooms of the house but finding things that we like and that are of the correct scale is a very time consuming business. No, one is never too old for a dolls' house or indeed any other toy!! You are so encouraging. Most of our friends think that we are completely mad. Yes, yes, yes....fetch the dolls' house out of the attic immediately!! How lovely! You have acquired a gem and searching for furnishings will be the best kind of treasure hunt! Lately everyone talks about simplifying, why not miniaturize instead! I painted, wallpapered, decorated and furnished an unfinished wood dollhouse for my little daughter years ago...even to the little silk flowers climbing over the doorway. I loved every minute of the project! What a perfect way to think of it....a treasure hunt! The silk flowers that you made for your daughter's dolls' house sound absolutely lovely. Alas, we do not have the skill required for that, but have taken to staining new furniture to give it the patina of age. I absolutely love this- how special. I can't wait to get a doll house for my little girl... one day soon! Our advice would be not to wait! You will have much enjoyment from it even if your little girl is still too young to appreciate it. What a great idea! Your are full of surprises, and good tips too! Will you be getting a dolls' house soon too?!! Your very kind comment is much appreciated. We shall certainly enjoy the furniture hunt although we suspect that it might take some time. But then better to travel than to arrive...and all of that!! Simply lovely! The right response to those horrible Barbie's dolls' plastic houses. I have always been fascinated by doll houses and always used to play with my sister's. A couple of years ago we saw Queen Mary's doll house and thought it was simply amazing! My St Nicholas Rd house would make a good Doll's house, and I've often thought of making one. Sadly I have but grandsons (4), so it might go unloved. Thanks to leavings all this nice coments on my blog? It's make me so happy! :-). I love that doll house, and also the history. You are so right! The fight against Barbie begins here as the fight against gnomes [and the emaciated Snow White] is raging with you. Our advice would be, go out and get one for they are really huge fun! Queen Mary's dolls' house we have not seen, other than in pictures, but would very much like to. We imagine that it is truly impressive [but then we are great admirers of Lutyens]. How splendid it would be to make a scale model of your St. Nicholas Road house which, we are fairly sure, would rapidly, if not now, in time, be of interest to your grandsons. We very much enjoy reading your posts, Jérome, so the pleasure is entirely ours. We are so pleased that you like 'Hove Villa' - it now needs lots of suitable furniture. Greetings from a sunny and warm Brighton!! Dear Jane and Lance, I realised that I've just discovered two doll buddies in you. I love old fashioned dolls (I get copies of sale catalogues from Christie's and Sotheby's). I don't buy anything expensive but I love looking at these catalogues and read about the history behind the dolls. I've got a collection of old antique teddy bears and vintage bisque dolls and papier mache dolls. I display them in the glass cabinets. I've never heard of G. and J. Lines Ltd. before. But its history sounds intriguing. With doll houses, if you are into interior decoration, the possibilities of decorating a doll house is endless and you can redecorate over and over again without the hassle of contractors and plumbers!! How wonderful all of this sounds! Kindred spirits indeed. Is there any possibility that you might, one day, do a post on some of or a part of your collection? We do, in Budapest, have some teddy bears dating from the 1950s but none is, alas, a Steiff bear. Old sale catalogues can be fascinating and we have a number ourselves from Christie's and Sotheby's auction houses. And what you say about interior decoration of dolls' houses is absolutely right - as much and as often as one wants and no mess! My dears, Hello again. 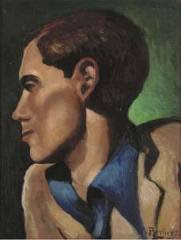 Our messages are crossing...thank you so much for your comments and recommendation on Duncan Grant (he is one of my favourites in the Bloomsbury Group) exhibition. I'm sure that it would be incredible. In my last visit, I came to Brighton with the intention of visiting Charleston in Sussex where Duncan Grant used to live with Vanessa Bell as you would know. But it was pouring with rain and I never made it to Charleston. But I went to see the fabuslous exhibition on Rex Whistler instead. So, that was a solace. Oh my dears, I really ought to make an effort!! Adieu for now, ASD. We are so pleased that you share our enthusiasm! Thank you for your comment. Oh, yes, you really must visit Charleston. And, although we usually avoid such things, the guided tours of the house are excellent. Thank you for the link for the Brighton festival. There are some most interesting events on offer although we return to Budapest in a week's time. Tonight we shall go to a Private View of one of the Artist Open Houses which also run throughout the Festival. Cyril Mount, a nonagenarian, and previously a war artist, is exhibiting! I love the doll house... and no, I did not have one! ;) Your post on your apartment, Belleek, and seashells was just beautiful. I love your blog, and do wish I responded to it more. That being said, thank you for the incredibly kind thoughts and words you have left on my blog. You have truly touched my heart. We are always so delighted to receive a comment from you but do appreciate how difficult it must be to find time for everything. Do not worry, we love reading your posts and shall visit often. It is still not too late to get a dolls' house!! And, we are so pleased that you like the apartment and the china. Belleek is rather strange but we do love it. Careful now, or all the eccentrics of Blogtopia will start sending you their miniature patchwork quilts that they have laboured over for months, so much so that you will have to apply to build a period-style extension to Hove Villa, which is indeed exquisite. What wonderful people you are. Do you really think so...about the quilts, we mean? We are still laughing at your comment, but perhaps it is with nervousness rather than joy!! We are thrilled that you like the dolls' house, and we have no intention of letting dolls [or quilts] anywhere near it!! she makes the most amazing dolls house furniture and miniatures. Fear not, dear Dash. No doll will ever cross the threshold of our dolls' house!! We are delighted that you like our house and are thrilled with the link which you have provided. We shall be investigating 'down under'[so to speak] as soon as we complete this reply. Hove Villa has my dream kitchen floor; just like my aunt Eileen's in 1970s Thornton Heath. I never forgave her for moving to Manchester and a house with beige lino. What fun you're going to have searching out furniture. We do agree, the kitchen floor is rather splendid and yes, possibly your Aunt Eileen could have done better than beige lino in Manchester. Having said that, we imagine lino is now seen as very retro and, therefore, highly desirable. I still have the doll house my daddy made my sister (who is MUCH older than me, honest! I mean she's OLD and lucky for me she doesn't read blogs) in the 1950s. Doll houses are just plain happy places and yours looks like a wonderful place to dream. How wonderful that you still have a dolls' house and such a personal one, although we do appreciate it was made for your much, much older sister way back in the 1950s - long before any of us can remember!! And thank you, we are sure we will enjoy ours. Doll houses are close to my heart, having built one for my daughters. Now with a granddaughter of four months, there will soon come a time to nurture those special moments with the vintage house we kept in our basement. What a fascinating and beautiful post! How wonderful! First, that you are clever enough to build a dolls' house and secondly, that it is soon to be retrieved from the basement to share with your grandchild. Thank you for such a generous comment. I know of no child of my generation or thereabouts who has ever owned a doll's house but I know several ladies well into middle age who do. Very elegant and beautifully appointed doll's houses they are too. Far too delicae and well-crafted for a child, actually. Enjoy Brighton, I loved the place. When Beloved was still working I used to accompany him to Brighton from London when he played for the Brighton Phil on a Sunday afternoon. Lots of white heads nodding off during the concerts. I hope you two stay awake if and when you go. Our housekeeper is a National Treasure and such a good cook. Quite unlike us...we are useless at anything remotely culinary. Happy Weekend to you too!! Yes, Health and Safety would have a field day with our dolls' house. Real glass and plenty of sharp metal bits and pieces!! Your husband's stint at the Brighton Phil sounds to have been great fun. We really laughed at your comment regarding the white - haired nodders offers in the audience. This reminded us of an august body called the Woolhope Club which was an historical society to which one had to be invited to join. Lectures [very long and generally tedious]were given in an overheated room and the average age of the membership was around 80. Needless to say, lecturers had to raise their voices above the snores [not ours, of course] by the end!! Never wanted a Dolls House but your looks like great fun. Do take some photos of Brighton from your window and when you are out and about so I can know where you are. how funny the word moderation was "cheer"
I love you guys!! This is exquisite and so aligned with my faith that what we love, no matter what part of our lives it "supposed" to belong in, it can still fit! and oh my, collecting for the interior - what fun!! Enjoy! I'm ready to pack my matchbox full of clothes, grab my thimble perch and move right into Hove Villa! What a lovely house!!! Its a historical candy, and even sweeter because its for dolls. I wish you luck in the collection of furniture! We are certainly enjoying the fun of having the dolls' house - pure indulgence!! We may well do a post on Brighton as only last evening we took the view from our windows by night to contrast with the view by day. In progress, as they say. And yes, sometimes the word for 'moderation' fits exactly. Cheers to you and have a happy weekend. Your comment is so very generous. Thank you so much. There may well be a 'time' for everything but, as you say, such things are really not important. Go with the flow, to use a modern day expression! Put like that, it does seem a little extravagant!! Whatever, we are enjoying being part of the home owning democracy. We much enjoy reading your posts. Could we want for a more perfect tenant? Witty and amusing, creative and original, lively and intelligent, cultured.....you may move in whenever you wish! We are so pleased that you like the house. We had been looking for some time and particularly wanted one made by Lines Bros. for the connection with our friend, Jeremy. Finding the furniture will be fun! Congratulations on your new property acquisition. I was lucky enough to have a beautiful doll's house which my father made. My one regret is that it was given away to a neighbour's children when I had outgrown it. So, I have often toyed with the idea of having a new one made as a copy of our present home. However, while I have been thinking, inflation has pushed-up the cost of doll house building and I am left still dreaming. How wonderful it would have been to be able to shop at 1923 prices. I also see that a doll's house is recommended to keep little girls out of mischief. Does this still apply do you think? Wishing you lots of fun with your project. I was disappointed to notice a while ago, in the Early Learning Centre, that their dolls' house was adorned with heart cut-outs and relentlessly bright pink - it might as well have been labelled 'keep away if you're not relentlessly girly and extremely young'. This one is so much more elegant and beautiful, but just as much fun for its original young owners. Oh, how sad that your dolls' house was given away. In our opinion, one never grows out of a dolls' house since they offer endless opportunities for redecoration and refurnishing. Just like a real house! But yes, a bespoke house would surely cost the National Debt. However, a terribly exciting thought!! You are so right. A bright pink, heart-shaped windowed dolls' house would never have 'cut the mustard' for us and, perhaps not for other would-be dolls' house owners. It is a sad reflection of our Health and Safety conscious days that all these houses and their contents are now labelled as for 'collectors only......not toys'. Thank you so much for becoming a Follower! I love doll's houses and your sense of whimsy, do you have Ibsen's volume tucked beside it? Yes, as we are discovering, dolls' houses are enormous fun. We did consider including a reference to Ibsen in the title of this post but then thought that it might seem somewhat obscure. In my most humble opinion, what started out as a mere child’s toy and by means of age and pedigree your very grand doll house has transcended into the realm of art. I take from your most resent posting that you have not purchased a play thing but have acquired a wonderful piece of sculpture. We are so thrilled that you like our dolls' house and that you are contemplating building one of your own. Neither of us would have the least abilty actually to construct a house [or at least, one which would stand up]and so we are in deepest admiration for your having those skills. Having the connection to our friend's, Jeremy's, family was important to us and seeking out a Lines Bros house was tricky. Needless to say, although we searched the length and breadth of the country, we found our 'Hove Villa' almost on our doorstep in Brighton! Oh yes, Gary....start building right away!! Your dolls' houses sound to have been absolutely wonderful. And, joy of joys, made by your father and complete with electric light too. How very, very sad that they were given away, perhaps under the false premise that both you and your sister had grown out of playing with a dolls' house? In our view, nothing could ever be further from the truth! great house...just adorable! will have to send a friend this post as she collects doll houses. just added your blog to my interesting list on my site. have a great Sunday!! We are so pleased that you like the house which both amuses and interests us. Finding suitable furniture which we like may poove tricky!! Thank you so much for adding us to your blog list - it is much appreciated. Thank you for your kind comment on my blog. It made me smile and wonder how your blog would look like. I was not dissapointed! What an interesting blog you have. Somehow your blog (the way you write/topics) reminds me of a anothter blog I used to visit and was one of my favourites. Unfortunately the lady who wrote the blog stopped blogging recently. The funny thing is that she divided her time between England and Budapest as well, just like you! What a lovely dollhouse you found. I don't think it was necessary to give us a reason. I totally understand :-). I would not mind having such a beautiful dollhouse in our home either. We are so pleased that you like the dolls' house. We felt rather like naughty children when we bought it, but now are having such fun finding things for it, although we think that it will take some time before it is fully furnished. As it happens, we were encouraged to start our blog by Edith Hope, [perhaps she is the woman to whom you refer], and she recommended you to us. We are delighted to have found you since your blog is full of interest and beautifully presented. We are thrilled to have you as a Follower and look forward to our keeping in touch. Too AAAdorable! I have a Wendy house, it's my studio -smile-. The quote, "educate the kiddies to love good furniture"...how true and wise. If more people were taught how to love good and nice things, perhaps things would receive better care. We are delighted that you like the dolls' house too. And, the idea of using a 'Wendy House' for a studio sounds simply lovely. Yes, learning to appreciate things in life and look after them rather than throw them away and replace with the newest fashion is a valuable lesson. At least, we think so! Thank you so much for the lovely comments you left on my blog. I am delighted to find Hattatt, you clearly have an interesting and fun lifestyle and I am looking forward to learning more about it through your posts. Sadly I never had a dolls house as a child either but would have dearly loved one, so I will enjoy watching you furnish the beautiful Hove Villa and I have a feeling you will do it with great discernment! We are delighted to welcome you as a Follower and thank you so much for your very generous and kind comment. Much of the fun of owning 'Hove Villa' will come in finding suitable furnishings which may take time but will, we are sure, add to the enjoyment. Kiddies at heart! I can always appreciate such kindred souls. Lovely acquisition! We are so pleased that you like the dolls' house. And growing up, we decided long agao, is to be avoided. Wishing to have a girl... just so I could play with doll houses (I have two super active wonderful boys). Oh well....life just isn't fair! But we could probably grow to like and love a train set!! you write just like edith hope, she recently closed her blog but boy you would have a lot in common with her. Although we should ourselves stick with the red, we are sure that the white will look very pretty - certainly if Patricia's painting is anything to go by. Edith Hope, who we do in fact know, suggested we should start a blog. She also pointed us in your direction saying she was sure we would like your dry sense of humour and your stylsh design ideas. Which we do!! What a lovely little doll house! I have a few collectible dolls...I'm drooling over this house. Wish I could get one. We are fascinated by the sound of your collection of dolls. May they one day become the subject of a post? We are so pleased you like the dolls' house. We promised ourselves one for years and now we are having such fun with it. that dolls house is neater, tidier and probably BIGGER than my cottage! Well, no chicken, dogs, cats or goat to mess it up! How lovely. What is the condition of your dollhouse? Has it been repainted or freshened up over the years? It is quite charming. Linda, we very much enjoy reading your posts and it is lovely to establish a friendship, even if it is in the blogosphere. We are fortunate as much of the dolls' house is in its original 1909 condition, having been touched up here and there. The chimneys are modern copies. Now we are searching for period furniture. Touch of the Edith Hope's here was my very first thought when I 'stumbled' on your blog especially the 'rooms' can remember my G/mama using the term! and Sherlock Holmes had 'rooms' in Baker st just love the way it rolls off the tongue..sorry to have gone off topic. Wondered if you ever visited Leominster,Church Stoke for antiques I have picked up some great items from amongst the dross. Love your apartment and look forward to seeing more photos and especially about living in Hungary. It is a fabulous piece. From what I can see of your Brighton rooms and wonderful Budapest villa, it is a great piece amongst other great pieces. I hope you enjoy it for many years to come. We are delighted to have your extensive comment and for you to make yourself known. We see that your blog 'Ida' does not at present have any posts, but please let us know if you do and we will gladly follow. During our years in Herefordshire we often 'did' the antique shops in Leominster but never, as far as we can recall, went to Church Stoke. Yes, 'rooms' seems a good term for our flat in Brighton which dates from 1828. A little bit Jane Austen sounding too! Edith Hope, who we know, suggested that we should start our blog and helped us to get going. We are pleased that you like it. It certainly is great fun although whether at our ages we should be playing with dolls' houses is another matter. Never mind, when we grow up......! It's absolutely delightful to hear that Peter Pan (x2) is alive and well and living in Budapest!! Jane and Lance: thank you for visiting my blog and for your nice comment. Now I have the pleasure of investigating your fascinating pages. I love the blogosphere -- so many interesting places to visit! You would, of course, be welcome at any time. We do hope that it is more a case of Peter Pan [x2] rather than entering a second childhood!! You are absolutely right, there are indeed so many very interesting, and varied, blogs to discover and enjoy. We shall look forward to your future posts and will hope to see you here again. I was in The Savoy two weeks ago - thought I had died and gone to heaven, I loved it all. Of course I had only been there once pre refurb so I can't wait to hear what you think. This is very heartening. We knew it well before its closure for refurbishment but have not been since it reopened some weeks back. We shall see, and report. We did though have a number of items, silver and china, from the sale two years ago. Wow, that dolls house is amazing! You have got a real find there. Especially with all the original furniture in there too. Nice one! We are delighted with the dolls' house. Too many hours now spent in playing. But who cares? My husband spent many hours making a doll's house for our younger daughter. It was a Christmas surprise, placed in the sitting room under tissue paper. Big sister gave her a pretend camera, that I recall costing no more than a pound. Little sister removed the tissue paper but barely glanced at the large doll's house, she just continued to play with the camera. I had a very deflated husband! Oh dear, all of that work, excitement and anticipation of your younger daughter's surprise and then, the great anti-climax. There must be a lesson in this for us all, but we are not sure what it is! Ah, but the dolls' house remains while the camera has long since disappeared! Yes it remains, the substance over the shadow, and someone will, we are sure, love it one day. 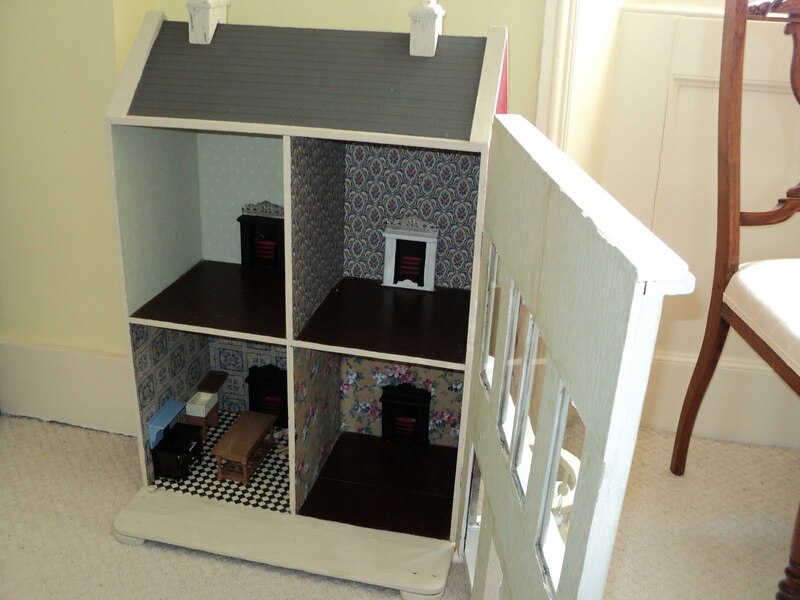 We are so pleased that you like the idea of the dolls' house. Perhaps adults, rather than children, enjoy them most. Did you keep yours? 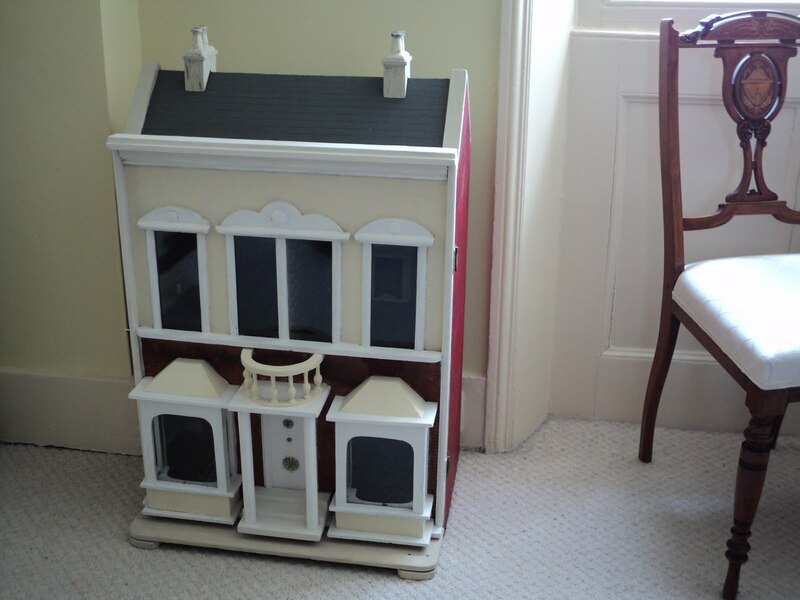 I`ve still got and treasure my dolls house, which I was given as a child over 50 years ago. It`s the one "toy" that I wouldn`t part with as I grew up. Guess that `health and safety` people today would be shocked at the sharpness of the edges of the metal washing machine in it,and some of the other items, but I never got hurt on it, I was taught to treat it with care. How absolutely wonderful to still have your dolls' house after all of these years. It is clearly a treasured possession. You are right, Health and Safety would, most likely, remove it and its contents from sale these days. Hmmmm, I admit to being a child at heart and still treasure some of my childhood toys and books. The Dolls' House looks lovely! We are delighted to learn that you still have toys and books from your childhood. Kindred spirits! 'Hove Villa' is proving great fun. I had a wonderfully authentic dollhouse as a child, complete with screw-in light fixtures that truly lit, detailed wallpaper, period-looking furnishings and beautiful hand-painted porcelain dolls. I spent hours rearranging rooms and imagining precocious life scenarios while listen to fantastically narrated books on tape like "The Wolves of Willoughby Chase." To this day I think this was the one "toy" -- not really a toy at all in fact -- that helped hone my attention to detail and my love for interior design and decor and flourish in general. What a wonderful addition to your warm home. And all of this sounds absolutely wonderful. What a splendid dolls' house it must have been and we so hope that, someplace, somewhere, a little girl or boy is enjoying it just as much as you did. We love the picture of your playing and listening to tapes. Totally perfect! Oh, how I love doll houses! I was lucky enough to be given my mother's 1930s dollhouse when I was six. We redid it - my mother painted it, made fabulous window treatments and we made rugs and all sorts of furniture from odds and ends. Shampoo lids in various colors became wastebasketsd for each room - color co-ordinated with the wall paper of course. When I was 11 or so, I attempted to trade my dollhouse for a skateboard; fortunately, my mother intervened and the dollhouse remained in our family. I was lucky enough to work in a dolll and dollhouse store during college - imagine what it was like to take inventory!! My advice to you is not to feel that you have to finish your dollhouse all at once. Take your t ime and have fun! We were delighted to have your comment and thank you for taking the time and trouble to write. Your dolls' house does, indeed, sound wonderful and what fun you clearly had with it. And how very wise of your mother to prevent your trading it for a skateboard!! The advice you give to take our time is very sound and well received. We shall do as you say which is, in any case, part of the pleasure of having it. We shall very much hope to welcome you here again in the future. Our understanding is that you do not have a blog, but if this is not the case, then please let us know. A Dolly Villa! I love the history of the company and how it links to Jeremy, the grandson of the founders, who you know. I have a thing for that era and particularly adverts from the period so thank you for including the 1923 example. I used to make my own doll houses as a child from cardboard boxes, scraps of material and bits of wood (luckily my father was a carpenter!). A Dolly Villa indeed, and that is how we shall think of it from now on! Quite by chance, the owner lived in Brighton and was advertising the house for sale on a Doll's House website. This meant that he was able to deliver it to us which was fortunate as it is so heavy. We are so pleased that you like the house and the background history, of course, is very important to us! Ooooh, I love your doll house!! So beautiful, tidy, and sweet. We are never too old for toys and having fun! Thank you for sharing your dolly house with all of us. Thank you so much for your kind comment. We agree that the child inside never grows to old for toys! And, thank you for becoming our latest follower. WE hope that you will continue to enjoy what we write. Erika, thank you so much for this most kind and generous comment. We love the connection of the dolls' house with our friend, Jeremy Lines, and it gives us much pleasure to seek out things for it.